Looking to add a new program to your camp? In 2017, twenty-three camps across the country and thousands of campers participated in the Summer Camp Bondar Challenge. 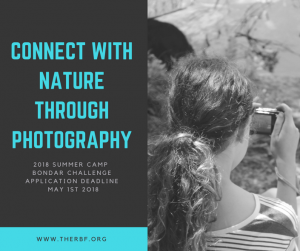 With direction form trained camp staff (training material available online and in hardcopy), campers took their cameras outdoors to explore, observe, appreciate, and photograph nature. Include this great program at your camp this summer! The deadline to apply is May 1, 2018. Download this Bondar Challenge flyer.